And so the final post of the year 2012. 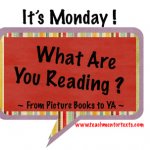 This week I read One For the Murphys by Lynda Mullaly Hunt. Oh my, what a wonderful book. What a story, that could just so pull at my heartstrings. Did I need tissues? Yes. A very special book to end the year on. I began it with Okay for Now by Gary Schmidt and I end it with this one. As it happens for me, the two best of the year. Plan for this week, something a little less draining! So, I am going to read The Recruit by Robert Muchamore. The very first in the Cherub series. Two of the boys in my class this year highly recommend this series, so I need to taste it so that I can steer others in the class towards it. The year is coming to a close and it is time to look back on 2012. This was my first year of really making an effort to read some books that my students might be reading or could read. Why did I never do this before I ask myself? The books are excellent and it has made a difference to the way we view books in our classroom. There are already very independent book worms in my classroom, but others have began to come on board. I have more of a feel for what might suit a particular student. I achieved my goal of 75 books read for the year. I would have been happy with 52, one for each week of the year, but some graphic novels were speedily read. I will be setting 52 for 2013, I like to read adult books as well and am aiming for 100 in that field, so I need to be realistic with middle grade and YA books. 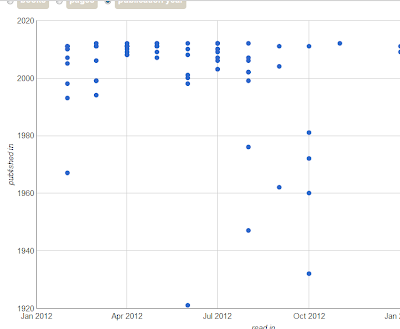 On Kevin Hodgson's blog I noticed he had pulled up the stats for his reading over the year. I only started at Goodreads for my children's and YA books this year, but have had a separate one for last three years for my other reading. ( Makes for a split personality at times, but I like to link with students on Goodreads with my 'teacher' account.) Anyway I pulled up the stats and it was a bit of fun to look back over the year in that way. I chose to clip a part that Okay for Now by Gary Schmidt on top, because that is the book I really love and remember with my heart the most from this year's reading, Loved it. It might not be as many pages as others, it doesn't matter, I am happy to do this much, plus by the end of the day I will have 224 pages to add to it from my final book of the year. It's coming in very close to Okay For Now, which I began the year with, so One For the Murphys is right up there too. 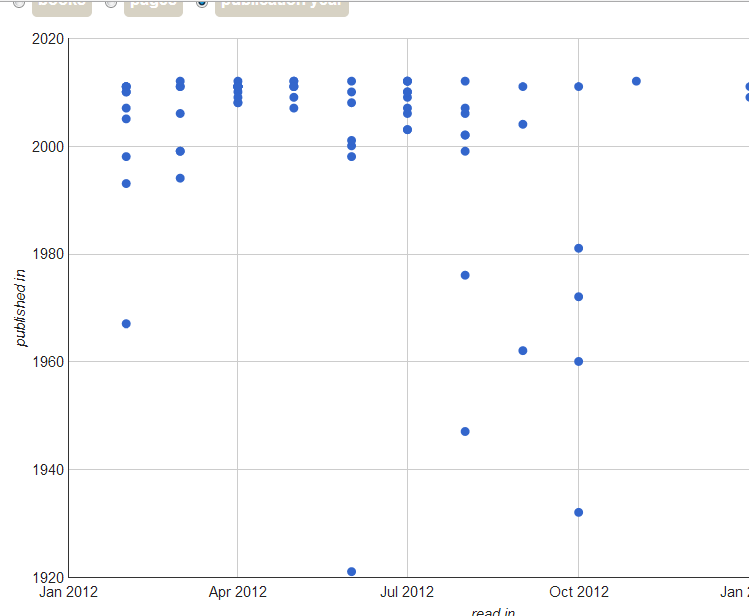 Finally a look at the years in which the books were published that I read. I have some early dates because I did manage to get about 18 of the Newbery award books read. The books have been very rewarding to read. As a teacher I enjoyed some of the comments on the Christmas cards that I received from my students, which showed they 'got' that I was reading. A student who hates to be without a book wrote on the card, "from one book lover to another". A student who has finally started to enjoy reading in 2012 ( have taught her for three years) wrote in the card, " Don't wary I won't stop reading in the holidays." and finally a student who I haven't been able to entice into a love of reading even though she can easily read says, "I will do some Reading in the holidays when I can." I love the books and I love the students, so until 2013........ when it begins all over again. 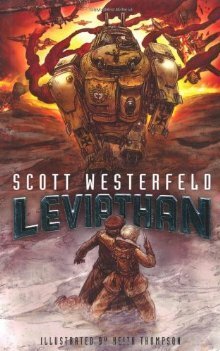 Leviathan by Scott Westerfield. This was my first ever from the Science Fiction steampunk genre. At the beginning of the year I didn't even know that steampunk existed! This book was recommended to me by one of my students, Monique, who was very enthusiastic about it. The first two chapters I was beginning to wonder, then I saw a note from katsok on Goodreads under this book, saying she had taken a couple of chapters to get into it. Great little comment, because it encouraged me to keep going and I did enjoy it very much. Lots of action and adventure. I can see that some of my other students would enjoy it too. 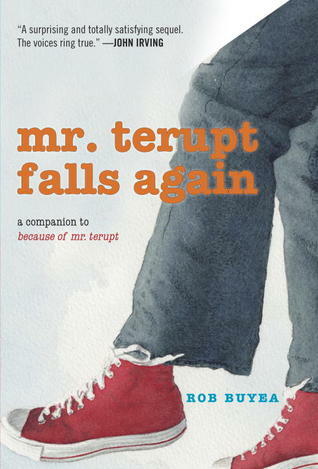 I am putting it on my list as a possible read aloud to the class for 2013. Will only not do that if something better comes along to take its place. 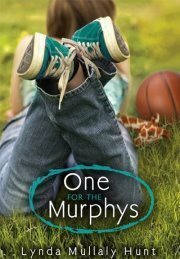 For the coming week all the books I want to read are out at the local library so I think I will start with One For the Murphys by Lynda Mullaly Hunt. I have seen many positive comments about this book so I am looking forward to it. 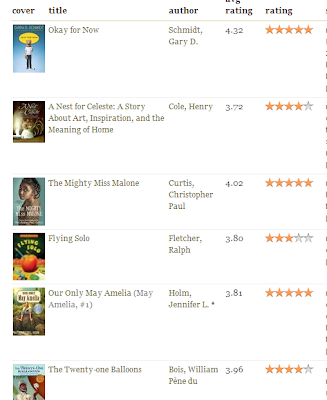 Lots of 5 stars from the readers I follow on Goodreads, and I see Donalyn Miller recommends tissues! Being Christmas Eve - and a sweltering hot day here on the Kapiti Coast in New Zealand, I wish you all the blessings of the Christmas season. By the way a bit of snow just sounds heavenly at the moment! Last week our school year ended and I said good-bye to my class, with tears expressing the sadness I felt because the Year 8 part of the class would be moving on to secondary school. Now of course that is an event to celebrate as well. So it was with mixed feelings that I said good-bye. What an awesome set of students. The Year 8 students, most of them, had been with me as Year 5's when we started out on our class blogging journey. Among them were a group of boys who went against the general trend. They loved to read, they were enthusiastic about learning. They were complemented by a wonderful set of girls. I couldn't believe my good fortune back in 2009 and from then to now, it's been a joy to teach and learn along with them. In 2010 I moved up with them and continued to do so. We were joined by a year below them, who also happened to be keen learners as well. They all got on very well together and by 2012 the present Yr 7's were sad to see them go. As 2012 moved forward the Year 8's continued to grow and become even more. Some of them began to hone their leadership skills, they happily collaborated with each other on many projects. They accepted whatever was going on, and I never heard a moan about anything. They just got on and did it. If someone did have a bone to pick, they did so individually and respectfully with me. Perhaps pointing out where they thought there was a lack of fairness, or as one student pointed out - you do have your favourites! We were able to talk it through and come to an acceptable solution. As the year came to a close there was a lack of Year 8 hijinks in the playground from both classes of Year 8's. Usually at that time of the year they get a little big for their boots! Not so this year, their energy was channelled into positive activities. What a blessing they have been. In the classroom I felt so relaxed with them, I never had to be worried about 'managing' them. The managed themselves. The Yr 8's along with the Year 6's and 7's mainly got along well together. Once however, I noticed a Year 6 mucking about and throwing a bit of a sulk. The other boys at the table just picked up their work and split to various parts of the room to get completed what had been assigned. Almost the whole class were eager to learn, completed work well and needed very little hassling. They were kind, generous, courteous and fun loving. While they were quite happy to cooperate with each other they were also competitive, especially when out playing sport. As the year ended, and the weather was beautiful, we would go out for a game of rounders. Everyone got involved, there were no half-hearted participants. The skills of throwing, catching, fielding were a pleasure to watch. I could turn to these students, throw some challenge at them and they could pick it up and run with it. Some of them were highly skilled with ICT and we learned so much off each other. More and more I could leave it to them to upskill each other and I could get on with other things. I loved teaching my class during 2012, and I thank especially the wonderful Year 8 section of it. I will miss them, although I do know it is time for them to take the next step in their journey in life. It's awhile since I took part in this, reading dwindled to a stop as the final term of the year encroached and writing reports and end of year functions took precedence. This was my read aloud to the class book for this final term. We had read Because of Mr Terupt in 2011 and were looking forward to this one. I have to say it was a bit of a disappointment for me, it seemed to lack a main focus. However the students enjoyed it and I see one of them has given it four stars on Goodreads to my three stars. Newbery winner for 2012 is where I became becalmed in my reading, so over the weekend I finished it. As it is semi autobiographical, it read a little like a memoir. 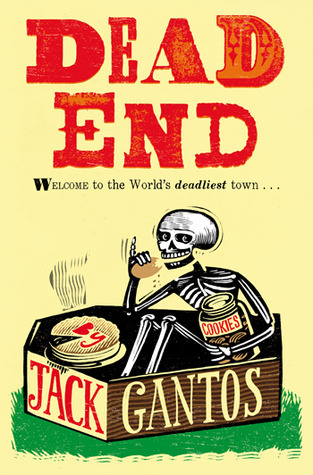 I enjoyed the humour and especially enjoyed the Grim Reaper visit to Mrs Dubicki's place. Also liked the relationship of Jack and Miss Volker. A possible read aloud for 2013. Will have to see what else I read over the summer holidays. The most amazing book I’ve read is Gone. That’s the title by the way. It took me awhile to read, as it is quite thick. But it was DEFINITELY worth the time! The book is by Michael Grant, of whom I look up to greatly as an author. The book is the first of a series of five, these are the names of all the books, Gone, hunger, Lies, (I’m reading that one right now) Plague and Fear. I will not explain Gone, it’s too complex. Hence the reason for you to read it, otherwise you will never know.